Surprise surprise, yesterday I found a ticket for a package in my mail box. Today I went to post office to pick up said package and it was my very first Shinki. She's very special, more so than the one who is on her way, cause this little girl was bought as a birthday gift from my girlfriend. She arrived much sooner than expected. And here she is. Vic Viper Blue Type Vervietta. I call her Rylie, and she is my assistant in the office. I work as a security guard and I figure there's no better gal to help me keep this place safe. I asked her to strike a cute pose for the camera and this is what she did. Welcome home my dear. I'll post a pic of her in her battle armor once we get home. Aw, she's a sweetheart. I have a Vervietta like her too, although I did buy a custom Pico Neemo body for her to use for non-combat purposes (and for dressing up). Oh? I had seen that the clothes fit, I didn't know the bodies worked too. Custom you say? 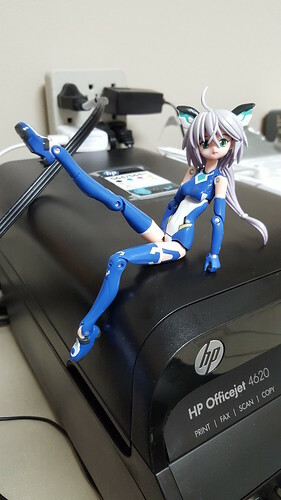 Well, shinki hips are a little narrower so the skirts may need a little work to keep on. And yes, MMS3 Shinki heads can fit pico neemo bodies, although you may need to mod the neck socket of the body. how well is the skin matchup? Vervietta's darker-toned than her wave sister Lirbiete, so it matches up better with the Pico Neemo "flesh tone" rather than their paler skintones used for Custom Lily.